Make brownies according to box instructions. Allow to cool completely. Cut brownies into 1-inch squares. Whip cream until soft peaks form. Whisk in sugar and vanilla. 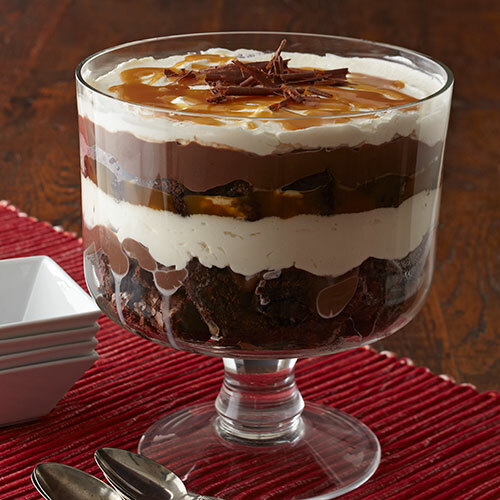 Layer ingredients in a 12 cup trifle bowl in this order; half of the brownies, half of the chocolate pudding, and half of the sweetened whipped cream. Heat the Sea Salt Caramel Sauce for 30-60 seconds in the microwave so it is pourable, but not hot. Drizzle Sea Salt Caramel Sauce over whipped cream. Repeat layering using remaining ingredients. Top trifle with chocolate curls. Chill until ready to serve. Can be made 2 hours ahead of time. Tip: Chocolate curls can be made by running a vegetable peeler along the flat side of a semisweet chocolate bar. This technique works best if the chocolate bar is room temperature.